Imagining the Tenth Dimension: Polls Archive 47 - Pictures More Important in Science? 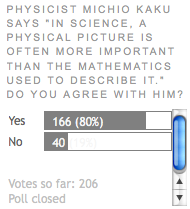 Polls Archive 47 - Pictures More Important in Science? "Physicist Michio Kaku says 'In science, a physical picture is often more important than the mathematics used to describe it.' Do you agree with him?" Poll ended Sept 4 2009. 80.6% said "yes", while 19.4% said "no". Last blog, in Is the Big Bang an Illusion?, we quoted an essay by Gevin Giorbran, which showed a way of thinking about time as being a direction in space. There were no equations, and no pictures to speak of, but essentially what Gevin was describing was a way of visualizing the underlying forms of our reality. Gevin, like me, also quoted from a number of the experts who do deal in those heady equations to arrive at the ideas we discuss here, and I think that's important to do only to the extent that it shows that the ways of visualizing reality we're discussing here are not just flights of fancy, but connected to (or at very least extrapolated from) mainstream science. For instance, when Stephen Hawking talks about there being another kind of time that is at right angles to our own time, that idea connects very strongly to my insistence that our reality comes from the fifth dimension, which is the dimension which is at "right angles" to spacetime. Calling the fourth dimension "time" and the fifth dimension "imaginary time" (as Hawking does) does manage to fit these ideas into a vocabulary that is accessible to more people, but it also confuses things somewhat, since the fifth dimension that physicists talk about is not a temporal dimension, but rather a spatial one. I've talked before about how each new spatial dimension is at "right angles" to the previous one, but if we're talking about pictures being more important than equations here I don't have an easy way to draw you a picture showing what fifth dimensional space looks like. What I can do is use the point-line-plane postulate to draw you pictures to show how if the third dimension is thought of as a point, the fourth dimension can be like a line, and the fifth dimension can be like a plane, and that is an accepted way in science to imagine any number of spatial dimensions. But here's an important concept: in Aren't There Really 11 Dimensions, I pointed out that saying there are ten spatial dimensions only makes sense when people accept that the fourth dimension is just as much a spatial dimension as all the others, and we get to that conclusion by accepting that for us "time" is just a way of moving within a particular spatial dimension, from one state to the next in a causal chain, and that there are other ways of moving within the fourth spatial dimension which make just as much sense. Time is a direction, not a dimension. The opposite direction to time can be called anti-time, and is no different than thinking about up/down or east/west as being other words we use to describe the opposing directions within some specific spatial dimension. Plus, the fourth spatial dimension has additional easily-visualized spatial dimensions on top of it, as we discussed in Time in 3 Dimensions. Here's three videos for you to look at that include animations that extend the visualization from my original Imagining the Tenth Dimension animation. I hope you will keep the Michio Kaku quote we looked at here today in mind as you watch these presentations. What Would a Flatlander Really See?